Because of that, I finally have time to blog about the weekend! Hooray! Never mind that I still haven’t blogged about the trip we took over Thanksgiving. I’ll probably never get to that, so I’ll hit the high points here — Ana got so sick that we ended up buying every kind of children’s medicine they sold on Disney property, I celebrated my thirty-fifth birthday by doing a training run with my younger husband as he insisted that I needed to be careful lest I “break a hip” in my old age (ahem), and I gave the resort we stayed in (Caribbean Beach) a big thumbs down because they didn’t have chocolate milkshakes. My flight to Orlando went by quickly, and in no time at all, I was eating a Krispy Kreme donut in Florida. Oh, yeah. Except airport Krispy Kreme donuts? Are never hot and ready, so I was disappointed. I worked on editing a book while I waited for my mother-in-law, and once she arrived, we were off to Walt Disney World! The first order of business once we got checked in was to head to the Expo to pick up our bibs, our packets of information, our T-shirts, her super cute RunDisney Dooney & Bourke bag… you know, the important things. And can I get some credit for NOT buying a purse on this trip? The temptation was strong, y’all, but I resisted! I had opted to do the Glass Slipper Challenge, which meant that I would be running both the 10K and the half marathon. I already knew my corral assignment for the half, which didn’t matter much at all since I would be heading back to my mother-in-law’s assigned corral. Corral placements are assigned based on your best time, and because my mother-in-law had never run a half marathon prior to this weekend and had no official time to submit, she was assigned to a corral about halfway in the middle — a great placement and one that we were both excited about. For a race that includes thousands of runners, I have to tell you that it’s way more exciting up at the front than it is in the back where you don’t even know if the race has officially started. I didn’t make any of the videos of the start, but I was just behind the leaders who were all poised and ready when the fireworks went off and we started running. I knew that I would likely be walking the half marathon route with my mother-in-law the next day, so I wasn’t looking to save anything, allowing me to keep pace with the leaders…. for about half a mile. Ha! Disney 10K runners are actually pretty fast, y’all! I was running a ten minute pace, which is really fast for me, and people were shooting past me like I was standing still. Unbelievable! Run, run, shirtless men and super skinny women! I kept that fast-for-me pace for the great majority of the race, reasoning that even though I had been passed by almost everyone in the A corral (lol! ), I was still on track to run my fastest 10K ever. It was hot and humid, but I was running this thing for fat girls everywhere. (Seriously. Fattest girl in the corral!) The sun wasn’t even up when I crossed the finish line at 1:08:41. I ran an 11:04 a mile pace, which is walking speed for elites… but it was still the fastest official 10K that I’ve ever run. A PR! At Disney! Who knew that was even possible?! I credit it all to my breakfast cereal, as evidenced by the way I proclaimed, upon getting my medal, “Behold! The power of Froot Loops!” Yes. 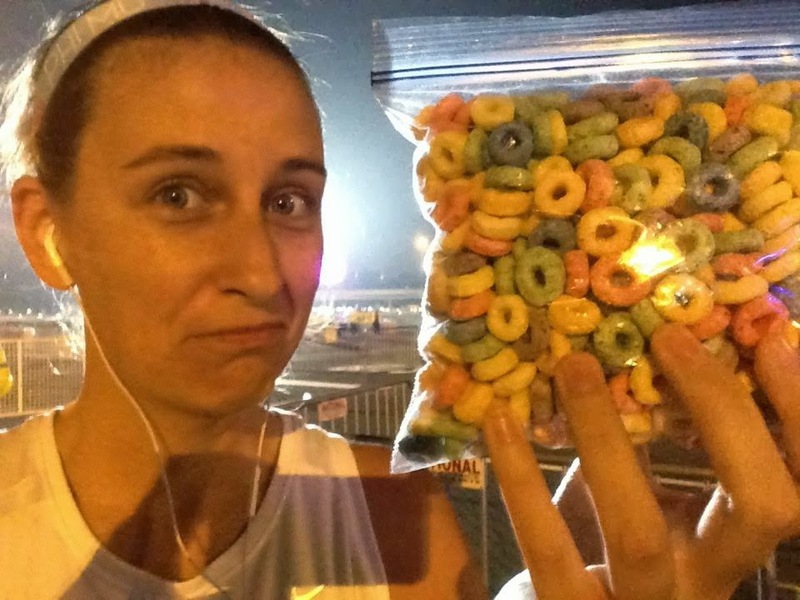 I had eaten my Froot Loops right there at the starting line, as all of those elites looked at me like I was in the wrong corral. Up next, the half marathon! Where once again we beheld the power of Froot Loops!